New York City office worker Frank is convinced the pigeons are plotting against him – when really, they are just trying to tell him something. 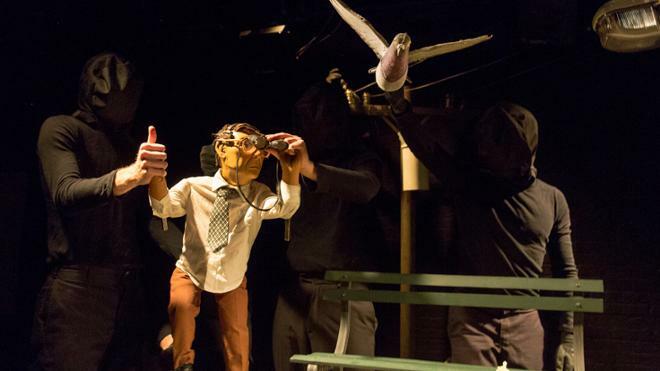 This imaginative and original theater piece created by Robin Frohardt spins bunraku-style puppetry, original music, and clever special effects into an adventure about the divide between man and nature and the illusion of control in the context of unexpected events. An ensemble of five puppeteers develop humorous, dialogue-free scenes for a whimsical journey that is at once contemporary and timeless. Following the performance, join us for a Q&A and behind-the-scenes look at the set and how the puppets operate. Tickets: $7 | One complimentary ticket with every 10 purchased. Need-based scholarships available. Modlin Arts School Series performances are available exclusively to public and private schools as well as homeschoolers, and are closed to the general public.